In the 1830's a young Norwegian wood-carver named Gudbrand Larsen saw some pipes made from meershcaum. He though they were beautiful and wanted to make pipes like that, but he could not obtain the material. So he decided to go where it was to be found. Gudbrand's son, August, followed in his father's footsteps and joined him in the business. However, father and son did not get along very well, so Junior--as August usually was called--did like his father once had, he traveled to learn more about pipe-making. In 1916 the factory was bought be a company that appointed new management, and a long, stable period of successful expansion had begun. That period was to last for almost half a century. The main part of the production was brair pipes, but they also continued to make some meerschaums. Problems at the factory began again at the end of the 1960s, when sales slowed dramatically. 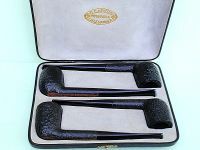 The main reason was the "fancy pipes" had become very popular, and Larsen's of Lillehammer had nothing to offer there. Something had to be done and two steps were taken. In the middle of the 1970s the Danish company Kriswill was bought, and in that way they obtained access to that company's more modern shapes. A new designer was also employed, but these efforts were not sufficient, and in the 1979 the factory closed. But the spirit of the Lillehammer factory live on, thanks to one single man--Bård Hansen. The following information was gleaned from a short thread on the Knox Cigar forum . 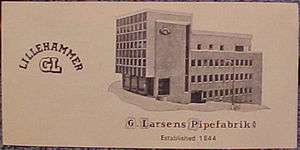 The Lillehammer pipes were made by G. Larsens in Lillehammer, Norway. 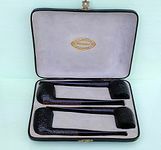 The founder Gudbrand Larsen, originally a wood carver, started making Meerschaums in the mid 19th century after a "Bildungsreise" to Turkey, something truly original in Norway at the time. He used only the best Meerschaum available and soon become famous outside of Norway. 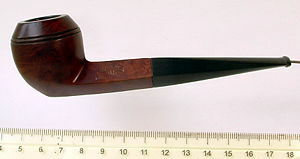 About the turn of the century he started making briar pipes. They were solid pipes in traditional shapes. The bowls tend to be small and the stems a bit longer than average. A factory history book published in 1944 focuses mainly on the G. Larsen meers. Lars Prestmoen was a very famous woodcarver in Lillehammer and employed by G. Larsens Pipefabrikk. Lars made some marvelous pipes for the factory. I believe he died sometime in the 1960's. 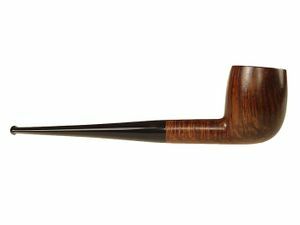 Sometime after WWII the Larsen factory closed down and the production was taken over by Stanwell, who still makes a line of pipes under the Lillehammer name. This page was last edited on 31 March 2018, at 07:42.